For every manufacturer, an A/C Cover cover fits like a glove. All covers are sewn right here in the U.S.A. Always have been. Affordable flat-fee shipping via FedEx. I just wanted to thank you for a truly custom quality product. My new cover actually does 'fit like a glove' and looks great! I will recommend A/C Covers whenever I can. I received the cover today. It fits perfectly! Thanks so much! I live in a 55+ community so maybe you will be getting more orders. I received my A/C cover today. It fits like a glove and exceeded my expectations. I will not hesitate to recommend your company. Nice job! 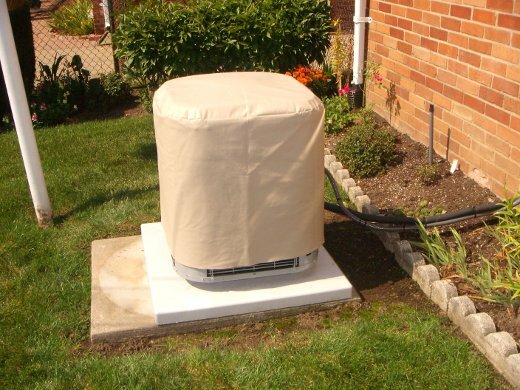 A custom fit Air Conditioner Cover will fit your air conditioner like a glove. We’ve spent years and worked with HVAC Professionals to design the perfect A/C Cover for every make and every model. We are consistently researching and improving designs to insure that every customer is satisfied and every A/C Cover is a high quality custom fit. for ALL air conditioning manufacturers!